The famous highly sought after Chinese 12AX7 tube. Known for its warm musical high gain properties.Used by Fender,ART and many others.This is a really fine tube,a must have for any 12AX7 tube collector. We have specially selected these using our "Dyno Test"proceedure and have branded them with our famous TNT logo. Other dealers sell this same tube for over $25. These are real quality musical tubes and are as good as they get! I have to say that I dont care what the so called guitar amp experts say. This Chinese tube is really a great tube. When the chinese first shut down their production I had every Major Amp company call me asking no pleading for my stock. 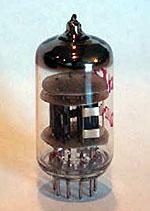 This sort of tells you something about the quality of this tube.Its one of the best if not the best 12AX7 tubes out there today.